Flip through the images in this book to find the Buddha that is yours. There will be one, or more, that will catch your eye and invite you to meditate on it’s beauty. The photographs in this book are unique. As a result of fires the summer of 2014 and extreme storms, many of the rock cairns in this book were destroyed. In their place are new ones, but the cairns in this book mostly do not exist. I went back after the fires and storms and was saddened to see so many gone, yet heartened to see so many new and different ones in their place. Truly a living meditation garden of rocks. Buy the Book On Amazon – available in Print or as an eBook. 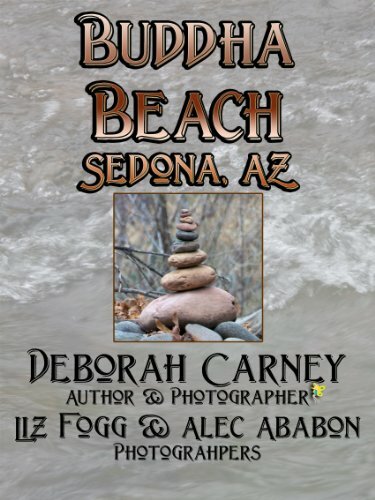 Photographers Deborah Carney, Liz Fogg and Alec Ababon capture the rock “buddhas” that caught their eye in a blend of beautiful imagery. Each photo has its own message; take the time to find it. Quotes from Buddha: As I (Deborah Carney) was photographing the tiny (and not so tiny) rock structures I knew they had to be paired with quotes and sayings from Buddha. I hope you will enjoy this journey through Buddha Beach paired with some insightful quotations. Buddha quotes need to be read slowly for the meaning to come to you. Many are open to interpretation, which means you will read the meaning you need to see and hear.